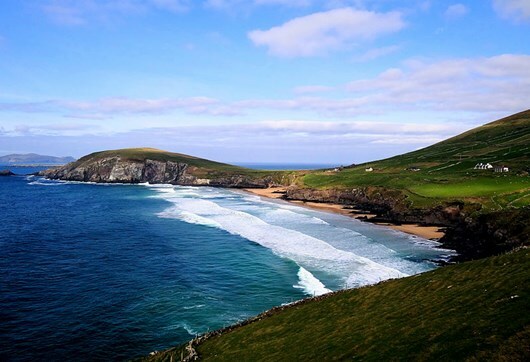 The Dingle Peninsula, or Sli Chorca Dhuibhne, stretches for 80 miles westwards into the Atlantic Ocean, with a mountain range as its spine. 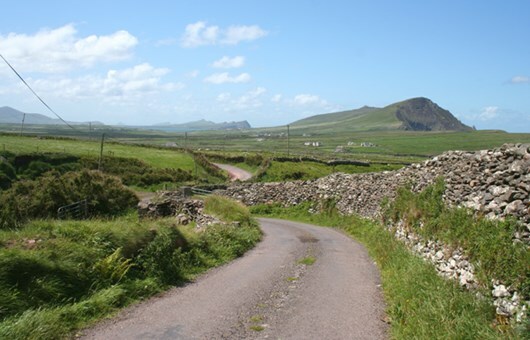 The Dingle Way is a long-distance walking route of 153 km or 95 miles that follows old tracks, mountain trails and green roads, often along the foothills of the mountains. Your tour starts and finishes at the village of Camp on the north side of the peninsula. This walk loops around one of the most beautiful peninsulas in Ireland offering spectacular views of mountain, sea and islands. 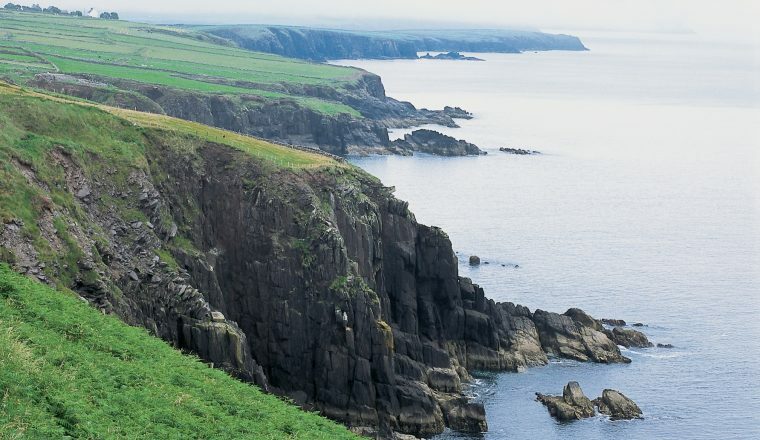 This walk takes you through the Dingle Gaeltact where Gaelic is the spoken language and live music, dance and culture is part of everyday life. 5 Day: £369.00 per person sharing, £55 single supplement. 8 Day: £599.00 per person sharing, £90.00 single supplement. 10 Day: £650 per person sharing, £115.00 single supplement. 5, 7 or 9 nights B & B or guesthouse accommodation; luggage transfers each day; detailed route descriptions and maps. Other meals; transfers to and from Camp; entries or excursions. 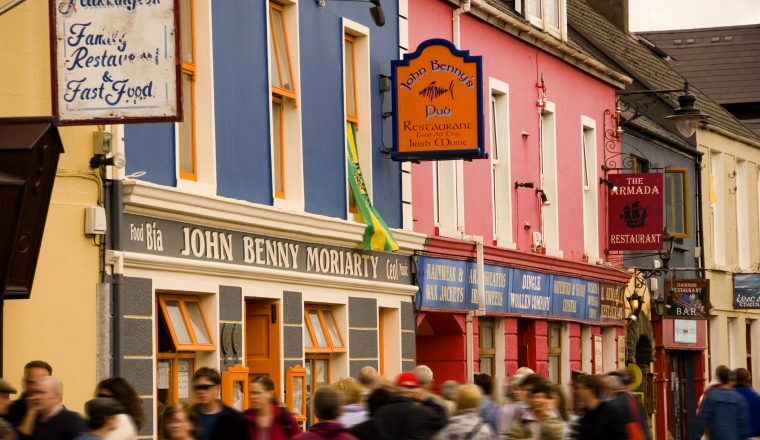 Extra night in Dingle, a fishing town with interesting streets, shops, restaurants and pubs. 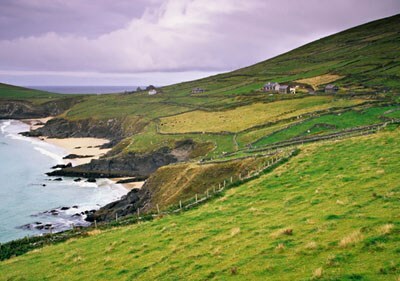 Or an extra night in Dunquin to visit the Blasket Islands off the western end of the peninsula. We can upgrade to hotel at extra cost in some places. Please ask. 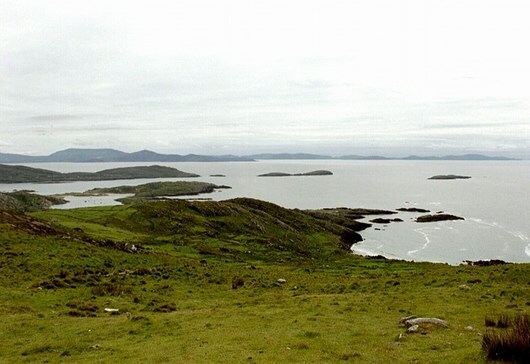 The gateway to the Dingle Peninsula, overlooking Tralee Bay, at the seaward end of Glen Fas. A stone promontory fort on the mountain slopes at theheight of 625m (2,050 ft) lies above the village, the highest fortification on the western fringe of Europe. Apart from the archaeological interest the fort is well worth a visit for the magnificent, extensive view of the Dingle peninsula. In Irish legend the fort is known as Cathair Chonroí. Camp is a small colourful settlement with a short circular walk to prepare for the week ahead! Walk on turf-cutter roads through the glorious bogland of Slieve Mish, punctuated with conifer and stacks of drying turf. 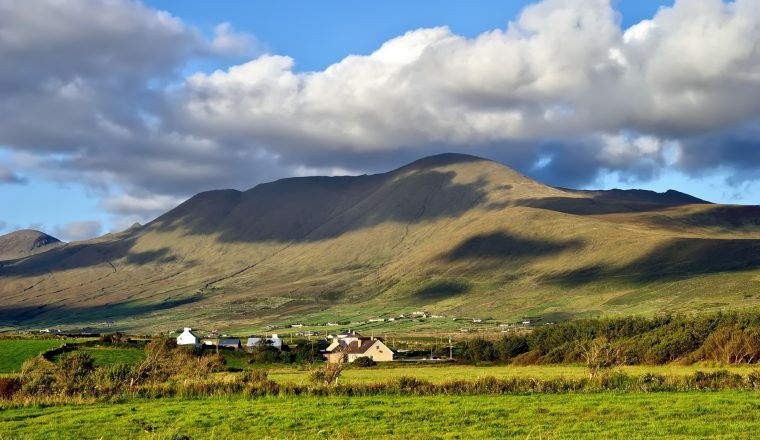 Climb the side of Ardroe Hill overlooking eight kilometres of sand dunes and beach at Inch with magnificent views across Dingle Bay to Ireland’s highest mountains at the centre of the Ring of Kerry. Follow the pass down to Annascaul for overnight. 17 kms/10.6 miles; ascents 430m; 6 hours approx. Walk among wild fuchsia hedges passing lovely Annascaul Lake to skirt Acres Hill to the remains of 16th century Minard Castle before turning inland to Lispole. Up to An Cnoc Maol Mor and then down following the old green road to the most westerly town in Europe with the mighty rampart of Brandon to the north and marvellous coastal scenery to the west. Overnight Dingle. 19 kms/11.9 miles; ascents of 410m; 7 hours approx. Mostly minor roads and beaches today and some of the finest scenery of the week. Walk along Ventry beach and then through fuchsia hedges to climb an old track on the foothills of Mt. Eagle, passing the early Christian beehiive huts at Fahan. Wonderful views as the way opens up to Slea Headand the Blasket Islands, the most westerly point of Europe. Overnight in the Irish-speaking village of Dunquin. 22 kms/13.75 miles; ascents 350m; 6 hours approx. 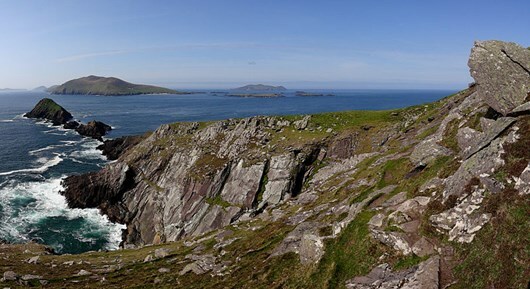 A visit to the Blasket Islands Interpretive Centre is recommended before setting off on the route around Smerwick Harbour and a detour to Dun an Oir, the ‘Fort of Gold’, where Italian and Spanish soldiers were besieged by troops of Elizabeth I. 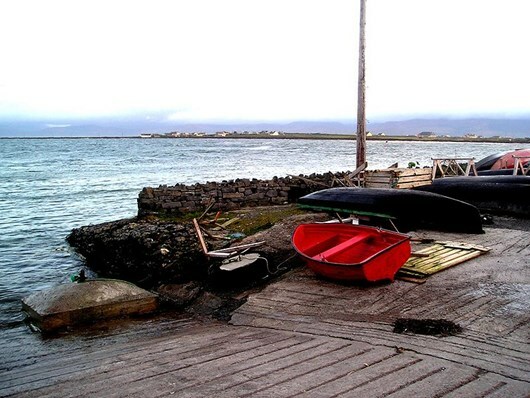 The thriving fishing village of Ballydavid is a Gaelic-speaking community. Overnight Ballydavid. 14 kms/8.75 miles; ascents 180m; 4 hours approx. Here you are in the cradle of early Christian civilization, with as many as sixty notable sites of cultural and religious development. Today walk up to the saddle of Mas an Tiompain (‘The Pass of the Drum’) below Brandon, Ireland’s second highest mountain at 950m. Wonderful scenery that is thrilling on a clear day, before the descent to Cloghane for overnight. 18 kms/11 miles; ascents 750m; 7 hours approx. Back to sea level with a walk following the coast. Either follow the whole Castlegregory promontory or cut across the neck of it via Lough Gill, home to Bewick swans and Natterjack toads. From Castlegregory village, mudflats and turf cuttings give way to farmland and a climb through Gleann na Gealt (‘The Valley of the Mad’) back to Camp for overnight. 22 kms/13.75 or 32/ kms/20 miles; ascents 30m; 6 or 8 hours approx. Free Day in Cloghane with a number of possible walking routes, coastal and mountains. 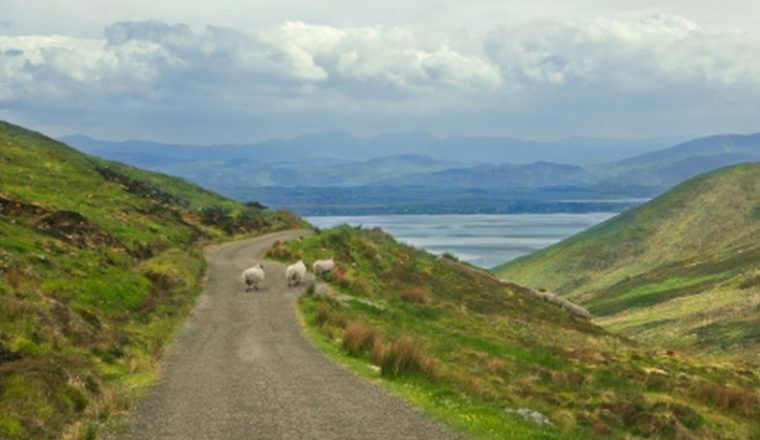 Visit Loch a Duin Valley rich in archaeological heritage. Castlegregory along the coast via Aughcashla Strand and back to first guesthouse in Camp. 11 kms/6.5 miles Via Glan Lough and Knock Beg 25 kms/15.6 miles. Departure by bus or taxi from guesthouse. Cork or Shannon, bus to Tralee. Kerry Regional Airport with taxi transfer to Tralee.